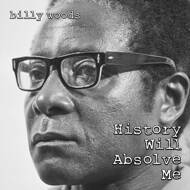 It’s been a long time coming, but after years of requests and more recently, a petition started by XYZ the repress of Billy Woods’ classic album "History Will Absolve Me" is here. This is definitely one for the fans, but it means just as much to us here at the label. It’s not an exaggeration to say that if this album had never dropped, Backwoodz might not be here today, so it’s with no small amount of pride that we issue this limited-edition pressing. The vinyl version also restores the album to it’s intended form by including the Mike Eagle and MarQ Spekt assisted track, “Frozen Sunlight” produced by Willie Green. It’s one of our favorite billy woods collaborations and we were all psyched to have it restored to the album. This deluxe 2xLP features the same iconic cover as the CD version but also contains original artwork by longtime Backwoodz collaborator PEM Designs.